جعفری, افشار, عابدی, زهرا, حسینپور فیضی, محمدعلی. (1394). تأثیر یک جلسه تمرین پلایومتریک و قدرتی با وزنه بر شاخص های زیست شیمیایی، التهابی و عملکردی آزردگی عضلانی در دختران والیبالیست. 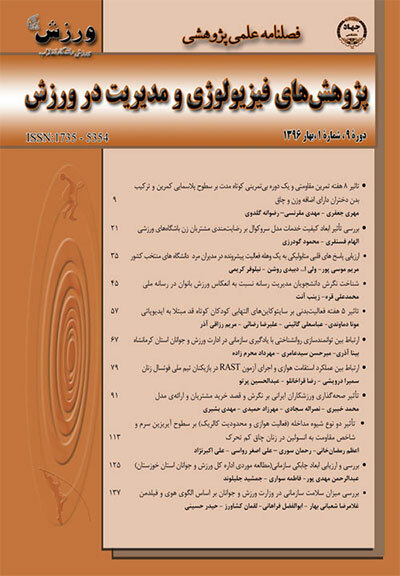 پژوهش های فیزیولوژی و مدیریت در ورزش, 7(4), 59-69. افشار جعفری; زهرا عابدی; محمدعلی حسینپور فیضی. "تأثیر یک جلسه تمرین پلایومتریک و قدرتی با وزنه بر شاخص های زیست شیمیایی، التهابی و عملکردی آزردگی عضلانی در دختران والیبالیست". پژوهش های فیزیولوژی و مدیریت در ورزش, 7, 4, 1394, 59-69. جعفری, افشار, عابدی, زهرا, حسینپور فیضی, محمدعلی. (1394). 'تأثیر یک جلسه تمرین پلایومتریک و قدرتی با وزنه بر شاخص های زیست شیمیایی، التهابی و عملکردی آزردگی عضلانی در دختران والیبالیست', پژوهش های فیزیولوژی و مدیریت در ورزش, 7(4), pp. 59-69. جعفری, افشار, عابدی, زهرا, حسینپور فیضی, محمدعلی. تأثیر یک جلسه تمرین پلایومتریک و قدرتی با وزنه بر شاخص های زیست شیمیایی، التهابی و عملکردی آزردگی عضلانی در دختران والیبالیست. پژوهش های فیزیولوژی و مدیریت در ورزش, 1394; 7(4): 59-69. 3دکترای بیولوژی، دانشکده علوم طبیعی، دانشگاه تبریز، تبریز، ایران. با توجه به نگرانی‌ها و تناقضات مربوط به آزردگی عضلانی ناشی از تمرینات پلایومتریک،تحقیق حاضر به منظور مقایسه‌ی تاثیر یک جلسه تمرین پلایومتریک و قدرتی با وزنه بر برخی از شاخص­های آزردگی عضلانی تأخیری در دختران والیبالیست انجام شد. بنابراین، 14 دختر والیبالیست 28-17 ساله در قالب یک طرح نیمه تجربی دو گروهی با اندازه‌گیری مکرر به طور تصادفی در یک جلسه تمرین قدرتی با وزنه (شش دوره پرس پا و باز کردن زانو با 70% یک تکرار بیشینه) یا پلایومتریک (شش دوره پرش عمقی و جانبی با 70% ‌ارتفاع پرش بیشینه) تا سرحد واماندگی شرکت کردند. شاخص‌های مربوط به آزردگی عضلانی طی چهار مرحله (10 روز و 30 دقیقه قبل، بلافاصله و 48 ساعت پس از جلسه‌ی تمرین) اندازه‌گیری شد. داده‌ها به صورت میانگین و انحراف استاندارد با استفاده از تحلیل واریانس مکرر و پس‌آزمون بونفرونی در سطح معنی‌داری پنج درصد بررسی شد. احساس درد، تورم، کراتین‌کیناز، لاکتات‌دهیدروژناز و پروتئین واکنشگر-C سرمی در هر دو گروه متعاقب تمرین به طور معنی‌دار افزایش یافت و تا 48 ساعت بالاتر از مقادیر پایه بود(05/0P<). اما انعطاف‌پذیری، قدرت هم‌طول بیشینه و اوج توان عضلات پایین‌تنه در هر دو گروه به طور معنی‌دار کاهش یافت و تا 48 ساعت کمتر از مقادیر اولیه بود(05/0P<). با توجه به میزان بازگشت به حالت اولیه برخی از شاخص‌ها متعاقب تمرین پلایومتریک می‌توان به دختران والیبالیست توصیه کرد که بدون نگرانی از این نوع تمرین استفاده نمایند. Based on conflicting results and concerns related to plyometric exercise- induced muscle soreness, the present study was conducted to compare the effect of a single-session plyometric and strength weight training on some indices of delay onset muscle soreness (DOMS) in female volleyball players. Therefore, in a quasi-experimental design, fourteen volleyball players (Female, aged 17-28 years) in two random homogeneous groups were participated in an exhaustive single-session strength weight training (6 sets leg press and Knee extension with 70% one repetition maximum) or plyometric training (6 sets deep and side jump with 70% Maximum high jump). All DOMS indices were determined in the four phases (10 days, 30 min before and immediately and 48 hours after exercise session). Data were expressed as mean (±SD) and analyzed by repeated measure ANOVA, Bonferroni and independent samples t tests at α≤0.05. Perceived soreness, thigh circumference, serum creatine kinase (CK), lactate dehydrogenase (LDH) and C-reactive protein (CRP) increased after the exercises and were more than the basal values until 48 hours (P<0.05). But, flexibility, maximal isometric strength and peak power output of lower limb decreased and were less than the basal values until 48 hours (P<0.05). Based upon the recovery rate of some DOMS indices in plyometric group, it can recommend to female volleyball players to use this type training without concerns. Aagaard P. (2010). The use of eccentric strength training to enhance maximal muscle strength, explosive force (RDF) and muscular power-consequences for athletic performance. Open Sports Sciences Journal. 3: 52-55. Barquilha G, Uchida MC, Santos VC, Moura NR, Lambertucci RH, Hatanaka E, et al. (2011). Characterization of the effects of one maximal repetition test on muscle injury and inflammation markers . WebmedCentral PHYSIOLOGY.. 2(3):WMC001717. Byrne C, Eston R. (2002). The effect of exercise-induced muscle damage on isometric and dynamic knee extensor strength and vertical jump performance. Journal of sports sciences. 20(5): 417-25. Chatzinikolaou A, Fatouros IG, Gourgoulis V, Avloniti A, Jamurtas AZ, Nikolaidis MG, et al. (2010). Time course of changes in performance and inflammatory responses after acute plyometric exercise. The Journal of Strength & Conditioning Research. 24(5):1389-98. Chen TC, Lin KY, Chen HL, Lin MJ, Nosaka K. (2011). Comparison in eccentric exercise-induced muscle damage among four limb muscles. European journal of applied physiology. 111(2): 211-23. Dousset E, Avela J, Ishikawa M, Kallio J, Kuitunen S, Kyrúlàinen H, et al. (2007). Bimodal recovery pattern in human skeletal muscle induced by exhaustive stretch-shortening cycle exercise. Medicine & Science in Sports & Exercise. 39(3):453-460. Ehrman JK editor. American College of Sports Medicine. (2010). ACSM's resource manual for Guidelines for exercise testing and prescription 6th edition. Philadelphia: Wolters Kluwer Health/Lippincott Williams & Wilkins. Pp 37, 337. Fatouros, A. Chatzinikolaou, V. Gourgoulis, A.Z. Jamurtas, A. Beneka, I. Georgiadis, S. Tokmakidis. (2003). Acute muscle soreness responses to plyometric and multijoint weight lifting exercises are related to intensity. American College of Sports Medicine, 50th Annual Meeting, San Francisco, CA, USA, June 2003. Medicine & Science in Sports & Exercise. 35(5): s403. Fatouros IG, Jamurtas AZ, Leontsini D, Taxildaris K, Aggelousis N, Kostopoulos N. (2000). Evaluation of plyometric exercise training, weight training, and their combination on vertical jumping performance and leg strength. J Strength Con and Res. 14(4): 470-479. Gibson RS. (2005). Principles of nutritional assessment. 2nd edition. New York: Oxford University Press. Pp 33-35. Impellizzeri FM, Castagna C, Rampinini E, Martino F, Fiorini S, Wisloff U. (2008). Effect of plyometric training on sand versus grass on muscle soreness, jumping and sprinting ability in soccer players. Br J Sports Med. 42(1):42-6. Jamurtas AZ, Fatouros IG, Buckenmeyer P, Kokkinidis E, Taxildaris K, Kambas A, et al. (2000). Effects of plyometric exercise on muscle soreness and plasma creatine kinase levels and its comparison with eccentric and concentric exercise. J Strength Con and Res. 14(1): 68-74. Jamurtas AZ, Theocharis V, Tofas T, Tsiokanos A, Yfanti C, Paschalis V, Koutedakis Y, Nosaka K. (2005). Comparison between leg and arm eccentric exercises of the same relative intensity on indices of muscle damage. Euro J Apply Physiology. 95(2-3): 179-85. Marginson V, Rowlands AN, Gleeson NP, Eston RG. (2005). Comparison of the symptoms of exercise- induced muscle damage after an initial and repeated bout of plyometric exercise in men and boys. J Appl Physiol. 99:1174-1181. Markovic G. (2007). Does plyometric training improve vertical jump height? A meta analyticaj review. J Sports Med. 41: 349-355. Markovic G, Jukic I, Milanovic D, Metikes D. (2007). Effect of sprint and plyometric training on muscle function and athletic performance. J Strength Con and Res. 21(2): 543-549. Milias GA, Nomikos T, Fragopoulou E, Athanasopoulos S, Antonopoulou S. (2005). Effects of eccentric exercise-induced muscle injury on blood levels of platelet activating factor (PAF) and other inflammatory markers. European journal of applied physiology. 95(5): 504-513. Miyama M, Nosaka K. (2004). Muscle damage and soreness following repeated bouts of consecutive drop jumps. Advances in Exercise and Sports Physiological. 10:63-69. Moodi H, Ghiasi F, Afshar M, Akbari A, Harati H, Moodi M et al . (2009). The effect of one kind of plyometric and aerobic exercises on chest expansion and respiratory volumes in high school students. J Shahrekord Univ Med Sci. 11 (2): 22-29. Paulsen G, Crameri R, Benestad Hb, Fjeld Jg, Mørkrid L, Hallén J. (2010). Time course of leukocyte accumulation in human muscle after eccentric exercise. Medicine & Science in Sports & Exercise. 42(1):75-85. Peake JM, Suzuki K, Hordern M, Wilson G, Nosaka K, Coombes JS. (2005). Plasma cytokine changes in relation to exercise intensity and muscle damage. Eur J Appl Physiol. 95(5-6): 514-521. Sayers Sp, Harackiewicz Dv, Harman Ea, Frykman Pn, Rosenstein Mt. (1999). Cross-validation of three jump power equations. Medicine & Science in Sports & Exercise. 31(4): 572-577. Tofas T, Jamurtas AZ, Fatouros I, Nikolaidis MG, Koutedakis Y, Sinouris EA, et al. (2008). Plyometric exercise increases serum indices of muscle damage and collagen breakdown. The Journal of Strength & Conditioning Research. 22(2): 490-496.